Black molded ABS snap on film clamps. Secure poly covering, shade cloth, frost covering securely to greenhouses, garden low tunnels. The rounded edges of these clamps reduce or prevent damage to the plastic covering when applying and removing. Secure poly covering, shade cloth, frost covering securely to greenhouses, garden low tunnels. The rounded edges of these clamps reduce or prevent damage to the plastic covering when applying and removing. 10 Pack-Black snap on film clamps. Secure poly covering, shade cloth, frost covering securely to greenhouses, garden low tunnels. The rounded edges of these clamps reduce or prevent damage to the plastic covering when applying and removing. 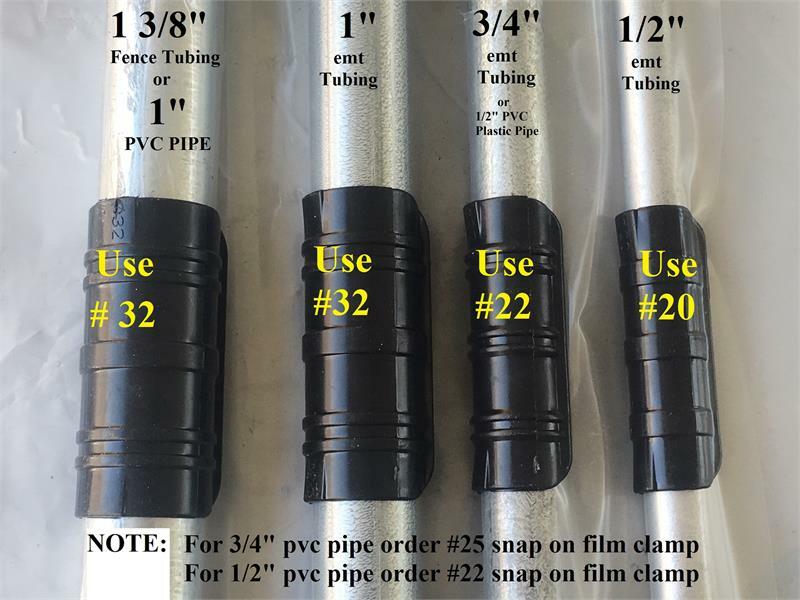 Tips on using ABS Plastic snap onto tubing clamps. 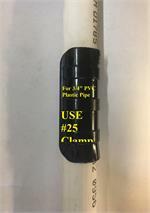 OPTIONAL: For fast easy clamp removal use fiberglass reinforced packaging tape wrapped one full turn with the last part on the inside of clamp shown below, then simply pull the tape to pop the clamp off. The tape shown is reinforced black tape but any reinforced packaging tape will work. To apply these clamps always start pushing one corner of the clamp over the tubing first then push as you rock the whole clamp firmly down over the film and tubing. Strapping tape is a high tensile strength tape, equipped with heavily reinforced filaments, leaves no residue behind and is resistant to breakage and tears. 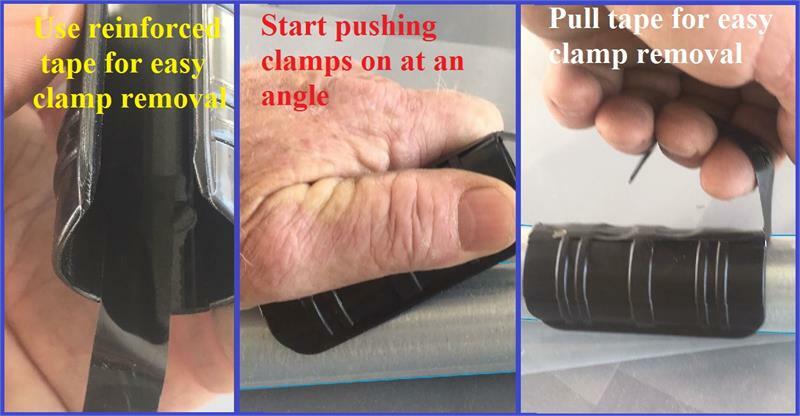 Can be used for quick removal of ABS poly clamps as shown in photo above. 10 Pack-Black #22 snap on film clamps. The rounded edges of these clamps reduce or prevent damage to the plastic covering when applying and removing.On orders of five or more 10 packs we may be shipped in bulk, loose in a box . 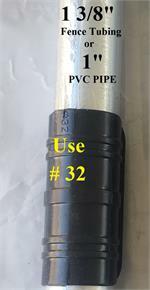 #25 clamp is best, if used in 3/4 inch off plastic pipe. On orders of five or more 10 packs we may be shipped in bulk, loose in a box . 10 Pack-Black #32 snap on film clamps. Secure poly covering, shade cloth, frost covering securely to greenhouses, garden low tunnels. The rounded edges of these clamps reduce or prevent damage to the plastic covering when applying and removing.